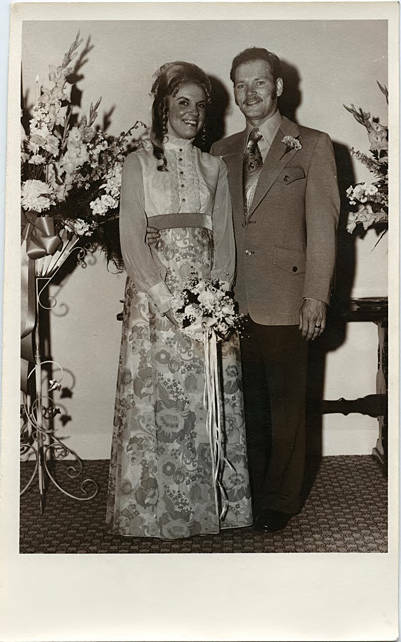 Black and white image of a couple, possibly a bride and groom. She wears a long, empire-waist dress with a light colored, long-sleeved top with a high neck and buttons up the front, and a floral print skirt. Her hair is long and pulled into a bouffant on top of her head before cascading down her back in ringlets. He wears a light colored suit with Western detailing and a wide, patterned tie. They stand against a wall between two large floral arrangements. This image is part of the Herbert McMullen bequest. McMullen was a local photographer who owned a studio in Hillsboro; he also collected images of local life taken by other photographers.